WARNING: As you may have guessed from the title, this post is gross. It is not recommended for those who are sensitive to images of raw meat. You have been warned. 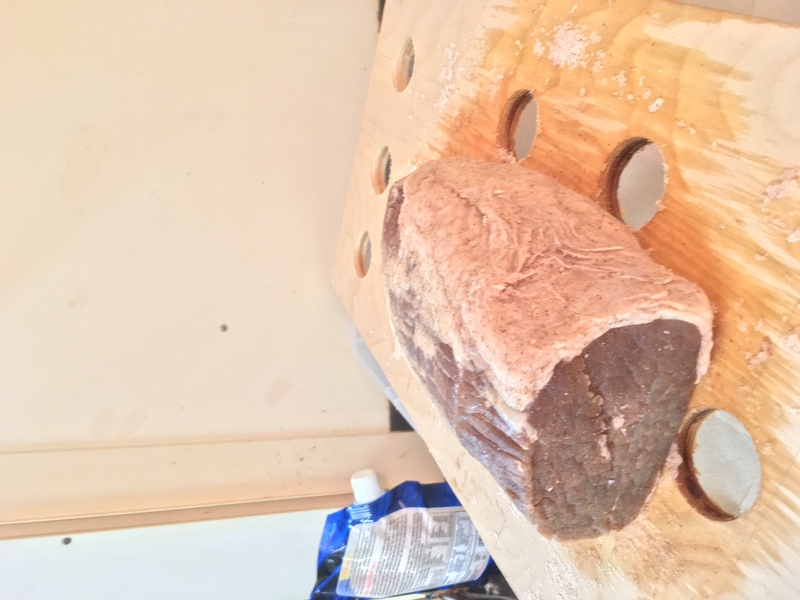 The most basic salted beef recipe is replicated here and serves as a preliminary run for what we will be doing on a larger scale in August, 2017. 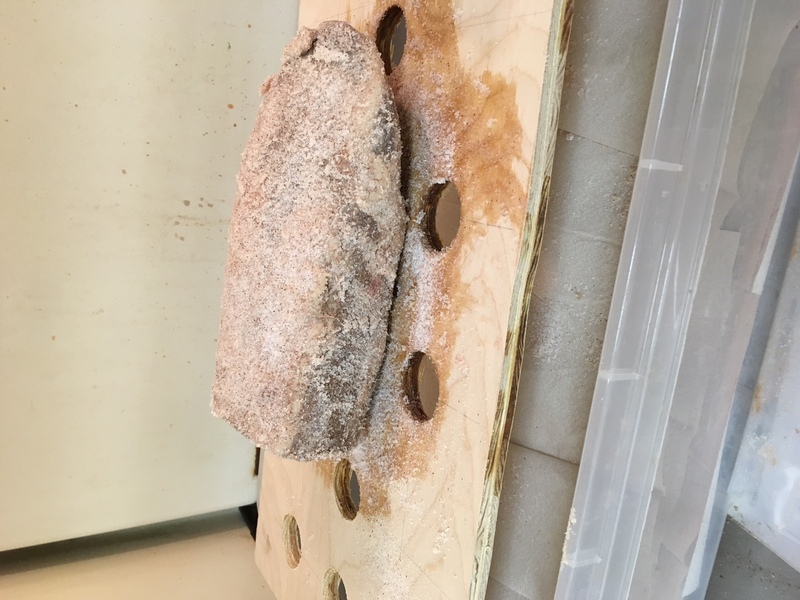 There are many variants of salted beef that include other ingredients such as sugar, salt peter (sodium nitrate), and spices and herbs, which are omitted in this recipe but which may be added during the final experiment depending on these test trials. 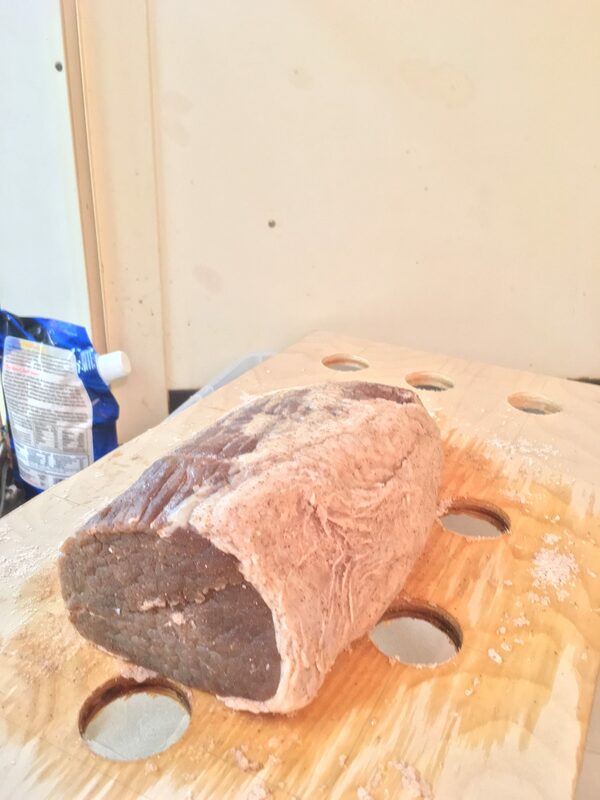 Take a cut of beef (4 to 8 lbs) and lay it on the salting board. Cover the surface of the meat with salt, being sure to coat the entirety of it. 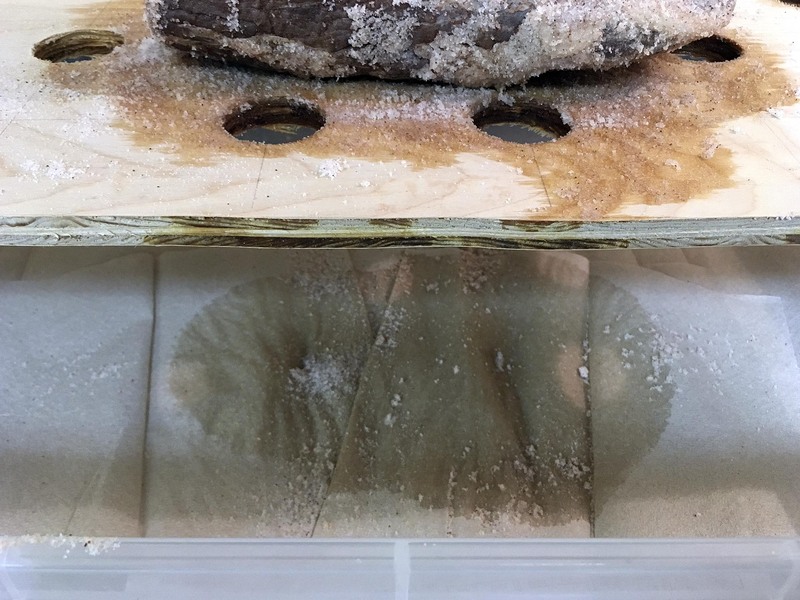 Let sit for a day and repeat the dry-salting for 4 to 5 days (the tub has holes that would have drained into the ground, but because this was done indoors, a plastic tub below the salting board was lined with paper towels that were changed each day when the meat was re-salted). 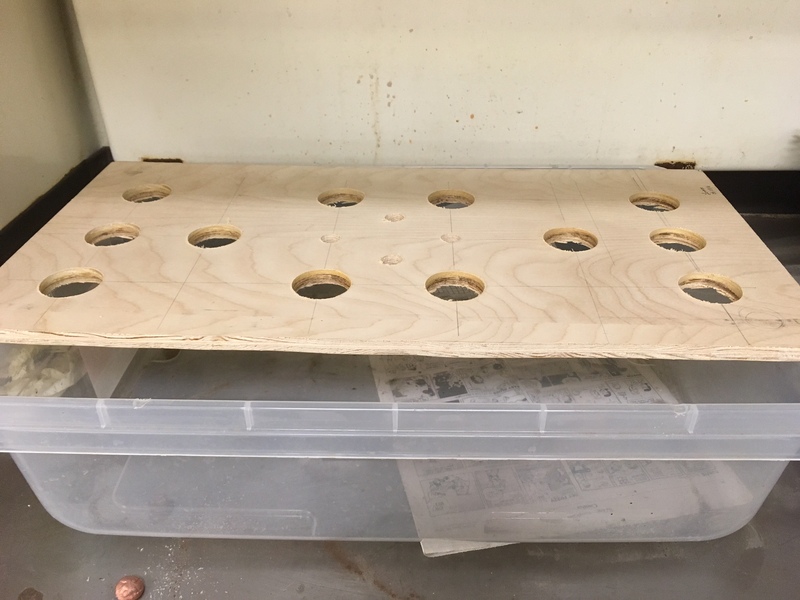 An excellently designed dry-salting board made with artistic talent by Dr. Donny Hamilton and Grace Tsai. 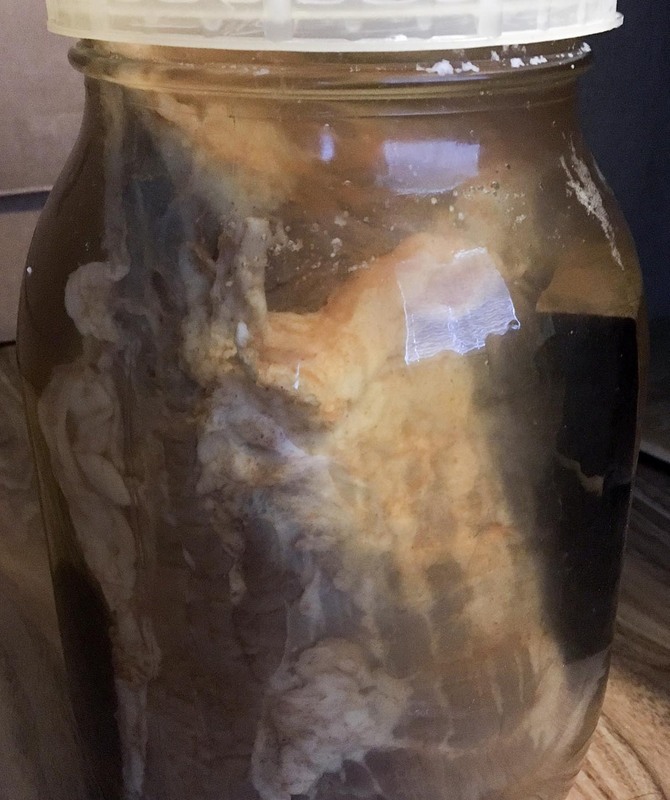 After 4 or 5 days, the brine is prepared by boiling salt and water together, until the mixture is salty enough to “float an egg.” The brine is put into a barrel and the beef cuts submerged in it, being weighed down by a rock. Saltpeter can be added to the brine if desired. A large 6 lbs cut of beef rump (USDA certified and grass-fed) was purchased from the local butcher shop at approximately 5 pm. The beef is vacuum-packed to retain freshness, because meat is usually salted shortly after butchering and our meat would not be salted until the next day. The beef was cut to about 4 lbs later the next day to allow it to fit into the glass jar. Natural sea salt was also purchased at the local supermarket. Two pieces of white oak were acquired from Glenn Grieco. They measure 4” x 1” x 1.25” and 3.75” x 1.06” x .94”. Approximately 4 lbs of beef ready for salting. Color: Deep pinkish red. Subcutaneous fat looks white/very light yellow. Very minor marbeling. Texture: Firm, smooth, and juicy. Still bloody in some places due to being vacuum-packed. Smell: Like fresh meat, almost no smell at all. Day 2 of Dry-Salting: Beef is noticeably darker and slightly firmer. Salt has melted off into the tub with the juices. 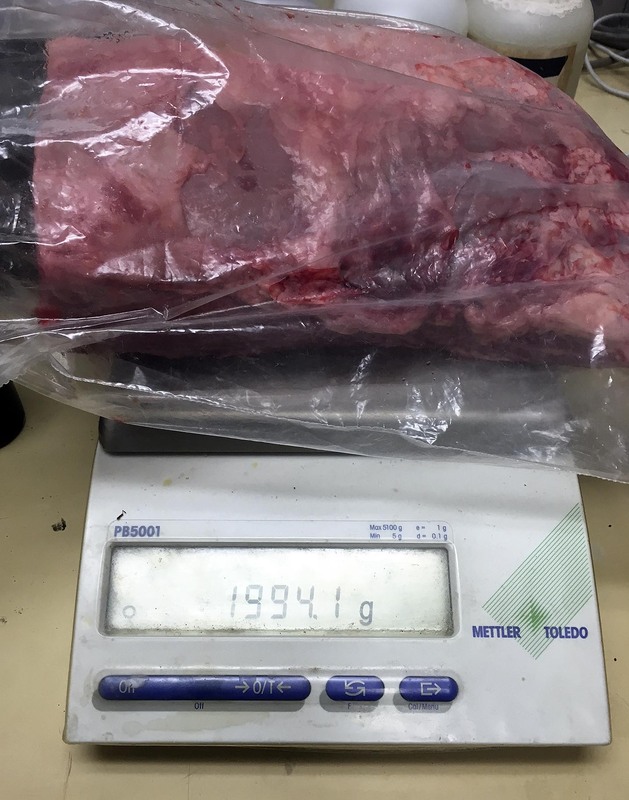 Color: Red meat is now brown, but subcutaneous fat is still white/light yellow. Specks of the colored salt can clearly be seen sitting on the surface of the subcutaneous layer of fat. Texture: Much firmer, no longer juicy. 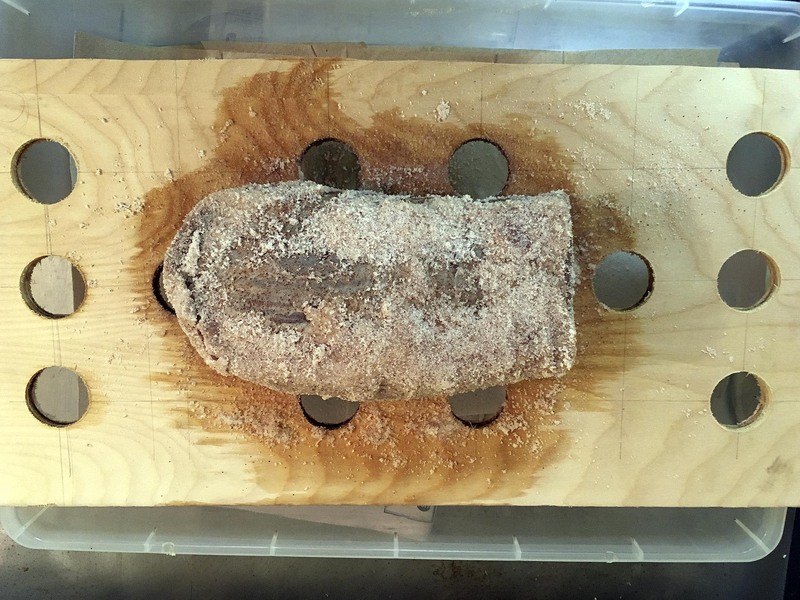 Smell: Meat does not have any smell, but the plywood has a noticeable smell from being soaked in the meat’s juices. The paper towels beneath the board are soaked through. 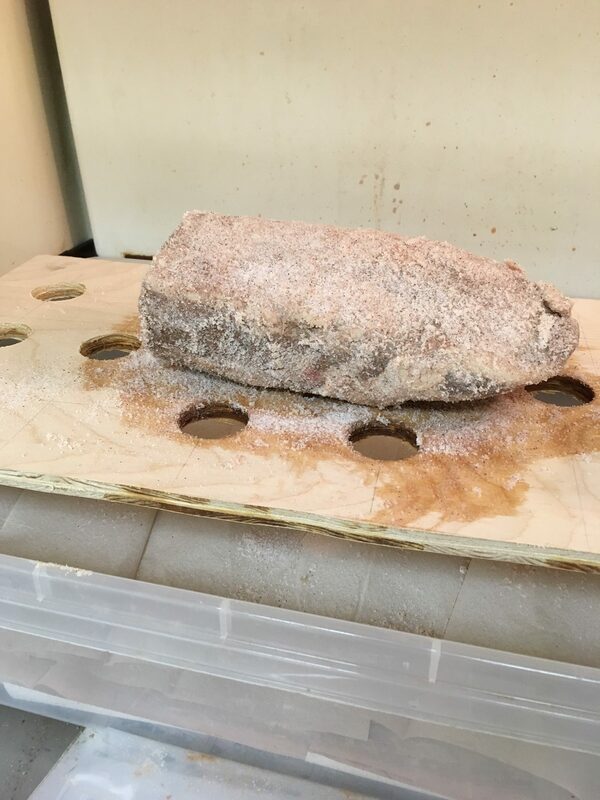 The salted beef after the third day of dry-salting. Texture: Very firm, and almost completely hard on the edge where the meat is thinnest (maybe 3 inches through). The center gives a little, but meat is generally quite firm. Smell: Faint smell, but now not only of wood, but also somewhat like a butcher shop with cured meat. Meat on Day 4 prior to daily coating of salt. Texture: Very hard. Edges are almost entirely solid. Center still gives a bit, but overall quite hard. Observations: Far less juices in bottom of tub. Salt is no longer being absorbed into the meat, or melting off with the juices, but rather stays on the meat’s surface. Meat juices at the bottom of the tub significantly decreased by Day 4. Brine was made to be used the next day according to the recipe. Meanwhile, the white oak pieces were soaked in water for 24 hours to remove excess tannins and chemicals, because casks were typically seasoned before use. Salt (g): None added for dry-curing. Time to put in brine! Color: Brown but difficult to see true color, as salt now sits on meat and none was absorbed overnight. Smell: Strong smell of curing meat. Observations: Almost no liquid at bottom of tub. The finished salted beef in brine. Check back soon to read about how the salted beef holds up!